J jumped a personal best of 7'2.5 in long jump finishing 5th. He also threw a personal best of 20-4.5 in shot put finishing 1st., He also threw a personal best in javelin of 67-9 finishing 1st. Jeremiah threw a personal best finishing 2nd in the turbo Javelin with a 32-6.5 and finished 2nd in shot put. 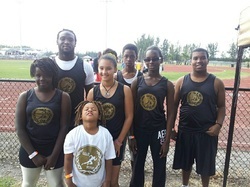 March 29, 2014 Jeremiah did long jump and shot put at the Pompano Express Meet he finished 2nd in shot put with a personal best of 19'0"
March 15, 2014 Jeramiah had a baseball game but still was able to compete in long jump. March 1, 2014 Cutis Park meet @ Betty Ferguson, Jeramiah did his first meet of the season he threw a 15'6" and did well in long jump. June 29 & 30, 2013 Jeremiah finished 5th and qualified for the AAU Junior Olympics in Michigan and got a personal best of 13'10.5" in shot put and finished 9th in the long Jump with a jump of 6'7.5"
June 15, 2013 Jeramiah finished 2nd in shot put with a new personal best of 13' 9.25" and finished 4th in long jump and 10th in the 100. June 1 & 2, 2013 AAU District Qualifier Jeramiah jumped a 5-10.25 in long jump and finished 9th he also threw a 13-00 for a personal best and finished 5th in shot put. Memorial Day Meet Jeramiah finished 2nd in Long jump with a jump of 6'1" and threw 11'5" in shot put and finished 2nd. He also did well in the 100 and placed 3rd. Jeramiah ran his first meet on Saturday at Pal of Hallandale meet he ran both the 100 and 200 meters and had a great time. Jeramiah ran his second meet of the season and finished both 4th in the 100m dash and the shot put. Great job. Jeramiah finished 5th in shot put and did well in the 100. Keep up the hard work Jeramiah. May 18, 2013 Tri County Championships Jeramiah finished 4th with a personal best in Long jump and finished 4th in his heat of the 100m dash.